Local make-up and FX artist, Ed Martinez, will be the guest speaker at Zombuddies Movie Night this Friday, April 30th at 6pm at the Krowswork Gallery, 480 23rd Street, Oakland, CA . 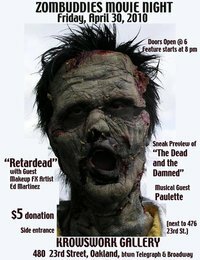 The evening’s entertainment will also include the ultra politically incorrect feature, “Retardead,”and a trailer from the new zombie western “The Dead and The Damned,” along with musical guest, Paulette. 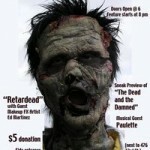 So get out there and enjoy a gritty Friday night in the ever-so-zombie-friendly East Bay.